Roasted dark malts plus extra chocolate malts plus ancho chile plus cinnamon plus organic vanilla extract plus a chocolate eating, beer drinking, Clown Shoes wearing, multi limbed, gorgeous and glorious Mexican wrestler on the label. That’s the recipe for a Chocolate Sombrero! This is a great little beer here and not to be missed. Cool artwork and and a great stout at a decent price as well !! The appearance is really nice dark and wispy head. The Smell is spot on with chocolate notes comming through. The Taste is right on with a super chocolate and spice notes throughout. The Mouthfeel stays with you it has a bit of a bite but a good one with the chile really standing out. overall this is a great representation of a chilie beer. I would have it again and recomend it as well. Beautiful black pour, nice dark creme head, thick and about an inch, recedes after a few minutes to a nice brown ring, great lacing on the glass. Smell is chocolate for sure, a little fudge and vanilla, big roasted malts. Taste has some cinnamon presence to it, nice and a but of subtle heat from the peppers. Cocoa and chocolate are heavy and present, not overpowering. No ingredient really takes the stage here, lots of nice cohesion between them all. Mouthfeel is medium, a little bit sticky, and right on point for a 9 percent brew. Overall another great offering from Clown Shoes. Thanks Master Cheeksalot for the bottle. Thought I had reviewed this at some point, surprise! A- Black bodied pour into a goblet with a one finger tan head. The frothy cap dies down fairly quickly to a ring at the edges and a few small islands. Sparse lacing. S- For the style and ABV not one of the most pungent examples I have had with milk chocolate, fudge, vanilla and coffee coming to mind; all wrapped together by roast barley. T- Starts off with moderately sweet malts bringing notes of milk chocolate, brownies, slight char, roastiness and some toasted nuts. The sweetness melds with the vanilla and the peppers come out late in the game, but only a tiny bit. Cinnamon seems to float in and out and reminds me of the Mexican bark pieces. MF- Substantially creamy texture to the heavy overall body. Carbonation comes in at a medium level and it finishes slightly warm and roasty bitter. Decadent feel. As good if not better than I remember from the first time I had this. The authentic cinnamon flavor becomes the key later on as it seems to really link the chocolate, roast grains and peppers. I wish I had some Mexican chocolate to eat along with this. Have no fear, I am still working on the eradication of the Bottle Backlog here at Chez Woody! I recently took a managerial position at a local Carryout bottle shop, so I do not have as much time to dedicate as I did, but for me, it is a dream job. I have access to reps, delivery persons, ordering, distributors, a multitude of customers & BEER! From the bottle: "Roasted dark malts plus extra chocolate malts plus ancho chile plus cinnamon plus vanilla extract plus a chocolate loving, beer drinking, Clown Shoes wearing, multi limbed, gorgeous and glorious Mexican wrestler on the label. That’s the recipe for a Chocolate Sombrero!" The label has changed slightly on the 12-oz bottle in that he is shirtless, wearing a somberero with a beer in each hand and attempting to outrun a pair of lasso-wielding & gun-toting chiles, respectively. Pop!ped the cap & gave it a heavy-handed pour. I watched in fascinated horror as the pseudo-cascade began to billow forth with foam that put me in mind of early sitcoms with washing machines & soap suds. Backing off, it sensed my consternation & also backed down, settling into a finger of dense, foamy, light-brown head with good retention. Color was solidly Black/Opaque (SRM = 44), allowing ZERO light penetration, but evincing garnet highlights at the edges. Nose was chocolaty with a light spiciness & it reminded me of Christmas in California. My uncle's friend's wife was big on Mexican culture & had a massive Dia de los Muertos display as well as a penchant for Mexican hot chocolate during the winter months. Mouthfeel was full and creamy with a tingly heat on the tongue. Oh, this was going to be fun! The taste, while chocolaty, was not really all that sweet. Nor was it really all that spicy & hot. It was warm & it made me wish that I had a double-boiler here at Chez Woody since I could then heat it up and drink it like Mexican hot chocolate. I have some friends who are wildly into pepper beers, but this would probably be on the low end of the spectrum for them. For me, it was a very pleasant surprise, kind of like getting something really neat-o keen in a box of Cracker Jack. Finish was like Baby Bear's Chocolate Stout - not too sweet, not too hot, but just right. It was dry, certainly, due to the spice, but not gaspingly so. A gentle tingle remained on my tongue & lips as a reminder of its presence. Quite tasty & slightly piquant! Today is Su, 31 March 2019. This is the seCANd of my New "Don't Call Me a 'Clown' Until You've Drank a CAN of Beer in My Shoes" Beer Sunday (Week 736) & naturally, it involves The CANQuest (tm). From the CAN: "Our Mission: To Produce Beer without Pretension while Being Free and a Little Crazy"; "Mexican-Style Chocolate Stout". The Crack! revealed a brimful craft CAN as I got a spritz across my fingertips! I decided to celebrate with a heavy-handed Glug, but when the luchador came rushing up at me in an unCANtrolled frenzy, I backed off. A pseudo-cascade then ensued, finally settling into just under two fingers of foamy, rocky, deep-tan/light-brown head with modest retention. Color was Very Dark Brown to Black/Opaque (SRM = > 34, < 44) with NE-quality clarity & cola highlights. Nose had the spiciness of MexiCAN hot chocolate! Mmm. Chocolate with spices - why doesn't Hershey's put out something like this?!? It is SO yummy & I am not big on sweets. Mouthfeel was like a big dollop having been scooped onto my tongue. I just allowed it to roll around like a playful puppy, getting the spices to really bloom in my mouth. Yummy! Finish was super dry, as should be expected when spices are used as adjuncts. I wouldn't want a steady diet of such a beer, but as a follow-up to a coffee-infused beer? Perfect! 2013 vintage. Pitch black pour with a nice two finger caramel-colored head with good retention and great lacing. Roasty, chocolaty nose with hints of cinnamon, cocoa, licorice, espresso, and vanilla. The taste follows suit with big roasty chocolate fudge notes with hints of cinnamon, espresso, cocoa, licorice, and as it warms, the chilies finally emerge but don't overpower. The mouthfeel is maybe a little thin for a stout, with a mouth-coating finish and a subtle burn from the chilies. Overall, this is a really flavorful and extremely drinkable chocolate stout. Color is black with a tan head. Produces pretty much no head even on a aggressive pour. Aroma has lots of roasted malt and sweet chocolate. The taste has roasted malts upfront followed by vanilla and sweet chocolate in the middle. Very mild cinnamon and pepper show up in the finish with roasted malt for a somewhat bitter finish. Full bodied, creamy texture to this, no booze at 9%, and very little carbonation. Overall, a very well balanced stout with the roastiness/pepper/cinnamon evenly matched with chocolate/vanilla flavors. Only complaint is I wish the peppers were more prominent, but this is still a great, flavorful stout at a great price too. Wow, another example of this style from Clown Shoes. I'm starting to warm up to their lineup. Pours a wicked black with a one-finger brown head into my glass. Reminds me of chocolate milk. Roasty, spicy, creamy with good interplay between the ancho chile and vanilla extract. Mmmmm. Dark, roasty malt that's creamy with a mixture of spicy chile, cinnamon and vanilla flavors. There's plenty of balance as-is to keep any one flavor from dominating, etc. Carbonation is ok and helps keep it from being a cloying mess. I can see this aging very well though to where the flavors come out better. Very good! I'm buying another bottle for aging purposes. The taste is a deep with a big bite of dark chocolate. There is a sweet underlying taste to this stout but not overpowering. A nice bitterness that lasts a bit. Overall it is a pretty good stout. The Chocolate is very prominent and I could have used a little less of it. I am glad I picked this up though. Pours very dark, almost black. There is a small ring of light tan head. Spotty lace. The nose has sweet milk chocolate, roasted malts, candied sugar and chilies. The taste is loaded with cocoa, light chilies, toasted malts, light vanilla, bitter chocolate. Well hidden ABV. The mouthfeel is medium bodied with a light level of carbonation. Sticky and sweet but balanced with the roasted malts. Overall, decent stout for the price and I will gladly re-visit it. 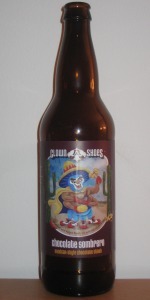 Clown Shoes' Chocolate Sombrero, a Mexican-style chocolate stout. 9% ABV. A: About half a finger's lopsided, tan head. Black in the glass. Deep red/cola in the light, and pours cola. A dot, here and there, of lacing. S: Dark cocoa dominates the nose. Slight chile. The faintest hint of cinnamon, in the background. T/MF: Nicely creamy feeling! Very dark cocoa flavor, bordering on coffee. A sharp sweetness along the sides of the tongue, near the back (where acidity is usually more noticeable). The flavors don't really pop, though. Actually, it's a very mellow beer. Probably a good gateway into darker beers! It's very easy drinking. I feel like this would work really well with food, but I couldn't say which. I picture Mexican food, in my head: Spicy, shredded beef, and Spanish/Mexican rice (the heavily seasoned red stuff that usually has little bits of peppers mixed in). Not sure if the flavors would compliment, though. I can't wait to try the Luchador En Fuego, based on the nose, alone! I thing the bourbon barrel aging will work well with the base flavors. Hopefully I find it soon! Poured from a 22 oz. bottle, into a Petrus chalice. L- Pretty much black, not really much light coming through, small latte colored head. S- Dark fruits, dark chocolate, cinnamon, touch of alcohol, light vanilla and chili. T- Dark cherry, dark chocolate, medium roast, not much alcohol, cinnamon, vanilla and chilies are there but subtle. Finish is of a medium roast coffee, some light hops. F- A light syrup good lower carbonation for the style. O- A very nice beer, nice to see it in 12oz bottles so I can grab a single when I'm craving the flavors. I enjoy that it's not too roasty and that the chili is subtle with a nice amount of cinnamon and vanilla in the mix. The label was better than the beer. Appearance - Pours black with cola brown edging where light can penetrate. The tan head builds and peaks at a finger's width before dying down in fair time, revealing a near-barren surface and a razor thin line of suds around the edge of the glass.Leaves no lacing. Smell - Big chocolate aroma with lesser notes of vanilla, smoke and roasted malt. Faint traces of spice. Taste - Follows the nose to an extent; big milk chocolate flavor dominates at the forefront. Vanilla kicks in with fair presence shortly thereafter, then a bit of cinnamon and spice toward the back end. Light earth, smoke and coffee character hit in the finish which help to deliver a balanced, bittersweet finish. Mouthfeel - Medium to full in body with low and slightly tingly carbonation. Silky smooth and easy finish. Overall - Really good. A bit more spice would've been nice, because it's fairly buried and therefore doesn't quite deliver on the promise of the label. Regardless, this is a nice, easy drinking Impy Stout with loads of chocolate. Unfortunately for the price, I'm probably one and done. I expect more out of a $10 bomber. Lightly chilled 22 oz. bomber into 33 cl tulips. Look- Hazy brown, pretty light for a stout- or even a porter. Half a finger of dense beige head on the pour, falls quickly leaving no lace. Smell- Spicy, milk chocolate, rum balls. Vaguely English-y malt presence, something nutty, but overwhelmingly smells of chocolate syrup and booze. Taste- Loads of spice, cocoa, and booze with an interesting rich malt backbone. Kind of tastes like a snickers bar dusted with chili powder. Mouthfeel- Medium body, minimal carbonation. Lighter than expected, but fairly boozy. Smooth on the sip, almost silky. Finishes warm and slightly powdery. Overall- Well, the name sounds like something you'd look up on urbandictionary, and it comes off as a little boozy, but for a choco-holic's brew it's not bad. Certainly better than 90% of the chocolate stouts out there, but really, really suffers in the style and drinkability departments. Actually, I'm considering snagging another of these to sit for a few months- I've got a feeling it'd be spectacular. As it is, though, it's worth trying but not worth revisiting.